Génesis Cabrera does not have any MLB stats for the season. Resides in Santo Domingo, Dominican Republic. Was acquired by the Cardinals along with OF Justin Williams and RHP Roel Ramírez from the Rays at the trade deadline for OF Tommy Pham and International Cap space...Named a Southern League (AA) All-Star and pitched a scoreless 3rd inning with two strikeouts for the South squad...Combined to post an 8-9 record with a 4.17 ERA over 25 starts (27 app.) striking out 148 batters over 140.1 innings...Pitched at the double-A level in Montgomery with the Rays and at double-A and triple-A with the Cardinals in Springfield and Memphis...Struck out a career-high 12 batters over 7.0 scoreless innings at Mississippi (6/4)...Pitched a season-high 8.0 scoreless innings vs. Birmingham (6/24), walking one while throwing a season-high 112 pitches...Ranked 3rd in the Southern League holding opponents to a .218 batting average...Held opposing left-handed batters to a .202 BA (30-148)...Made two relief appearances in the Pacific Coast League playoffs and threw 3.2 innings allowing one run...Worked 1.1 scoreless innings in Memphis' Triple-A Championship game win vs. Durham on 9/18...Made 20 relief appearances in the Domincian Winter League with Licey posting a line of 0-0 with a 1.26 ERA and 21 strikeouts in 14.1 innings...Hurled 19-of-20 scoreless appearances while stranding 9-of-12 inherited runners...Named the Dominican Winter League Rookie of the Year...Ranked as the No. 6 prospect in the Cardinals organization by Baseball America. 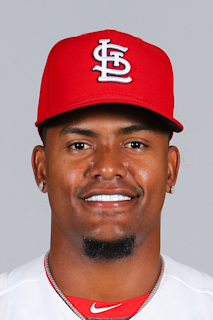 March 9, 2019 St. Louis Cardinals optioned LHP Genesis Cabrera to Memphis Redbirds. January 2, 2019 Tigres del Licey placed LHP Genesis Cabrera on the reserve list. November 20, 2018 St. Louis Cardinals selected the contract of Genesis Cabrera from Memphis Redbirds. October 13, 2018 LHP Genesis Cabrera assigned to Tigres del Licey. September 2, 2018 LHP Genesis Cabrera assigned to Memphis Redbirds from Springfield Cardinals. July 31, 2018 LHP Genesis Cabrera assigned to Springfield Cardinals. October 13, 2017 LHP Genesis Cabrera assigned to Tigres del Licey. June 26, 2017 LHP Genesis Cabrera assigned to Montgomery Biscuits from Charlotte Stone Crabs. April 4, 2017 LHP Genesis Cabrera assigned to Charlotte Stone Crabs from Bowling Green Hot Rods. September 7, 2016 LHP Genesis Cabrera assigned to Bowling Green Hot Rods from GCL Rays. September 2, 2016 LHP Genesis Cabrera assigned to GCL Rays from Bowling Green Hot Rods. April 5, 2016 LHP Genesis Cabrera assigned to Bowling Green Hot Rods from Princeton Rays. October 3, 2015 Princeton Rays activated LHP Genesis Cabrera from the temporarily inactive list. July 27, 2015 Princeton Rays placed LHP Genesis Cabrera on the temporarily inactive list. May 28, 2015 LHP Genesis Cabrera assigned to Princeton Rays from DSL Rays. March 7, 2014 LHP Genesis Cabrera assigned to DSL Rays. November 1, 2013 Tampa Bay Rays signed free agent LHP Genesis Cabrera to a minor league contract.